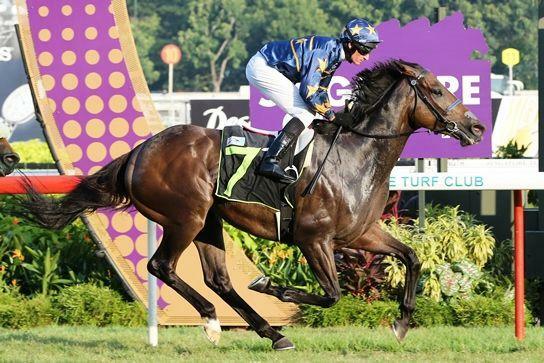 Talented galloper Lim’s Magic turned in a rousing hit-out at the Kranji barrier trials on Thursday morning. Partnered by Troy See, the Manhattan five-year-old never went around horses after beginning from barrier one, coming off a ground-saving spot in third on the rails to dash clear towards a two-length win from another rising star, Mister Yeoh (Michael Rodd). Trainer Stephen Gray said that Lim’s Magic was going to run first-up in the Group 3 Fortune Bowl (1400m) on February 6, his first race since his closing fifth to Elite Invincible in the Group 1 Dester Singapore Gold Cup (2000m) on November 11. He did toy with the idea of giving the Lim’s Stable-owned galloper a last fling in the 2018 season finale, the Group 3 Colonial Chief Stakes (1600m) on December 9, but eventually resisted the temptation, a decision he certainly did not regret. “He had a nice freshen-up after the Gold Cup,” said the New Zealander. “I thought of running him in the mile feature on the last day, but he had a hard race in the Gold Cup, though he ran super. It was a huge run. “He had a good trial this morning. It was a good blowout ahead of the Fortune Bowl. Lim’s Magic has long been vaunted as a star in the making from the get-go, especially off the back of his two wins, albeit in lower division, at his first prep in 2017. Last year was tipped to be his year, but it didn’t quite eventuate – he did not win a single race in seven starts. To be fair, he was set aside by a bug once, and was mainly aimed at Group events in which he might have come up short, but was seldom disgraced. “He has a lot of talent, that’s for sure, but he’s had a lot of bad luck, too,” Gray continued. See, who has in the past six months risen to the coveted position of champion owner (by stakes money) Lim’s Stable’s No 1 rider, will take the Lim’s Magic ride in the Fortune Bowl. Glen Boss was the regular partner, getting booked at all his 11 starts bar the last one in the Group 1 Dester Singapore Gold Cup (2000m) when ridden by Hong Kong-based Mauritian jockey Karis Teetan. Boss will get back on Countofmontecristo for Michael Clements, who incidentally, also confirmed Chopin’s Fantaisie will run in the Fortune Bowl after his third place to Lim’s Magic in the same Thursday barrier trial. “Troy is excited to be riding Lim’s Magic. He’s the Lim’s jockey now and I have no problem having him on board,” said Gray, who has not booked the 2018 champion apprentice jockey-turned-senior jockey all that often in the past. “Troy rode him the right way in the barrier trial. At the end of the day, he’s a horse with a lot of ability.